It has been a busy, stressful week and though the stress has been the best kind you could hope for (promising job interviews), I am still thrilled that we’ve finally reached the weekend. For a couple of days, I can take a break from the many things I have on my schedule and just breathe and hopefully read some of the truly wonderful books I have waiting for me. In an ideal world, I’d love to take those books and spend the entire weekend in this bright and lovely bedroom but I will just content myself with admiring it from afar. Good luck!! Similar happy stress here, too. 🙂 Although they’re very pretty, you couldn’t read in those foofy little chairs. A chaise, I think (I have always wanted one). Now this I do like, although the books have obviously been bought by the yard. Hope the job interviews turn into a wonderful job! I love bookshelves on either side of mantels, but oh those boring spines! Enjoy your weekend and the anticipation of good things to come. I would change absolutely nothing in this room … it is one of the best so far that you have shown us! Love it! Simon T, I disagree, I don’t think the books have been bought by the yard. I have some books which look like this on the shelves, leather-bound pocket books, McMillan’s pocket Hardy novels, etc, and from afar they also look as if they’ve been bought as book-wallpaper. Beautiful bedroom. Good luck with the interviews. Have a great weekend. Fingers crossed for the interview results! I can’t help noting the picture leaning against the wall by the bookcase, I do not understand this trend! 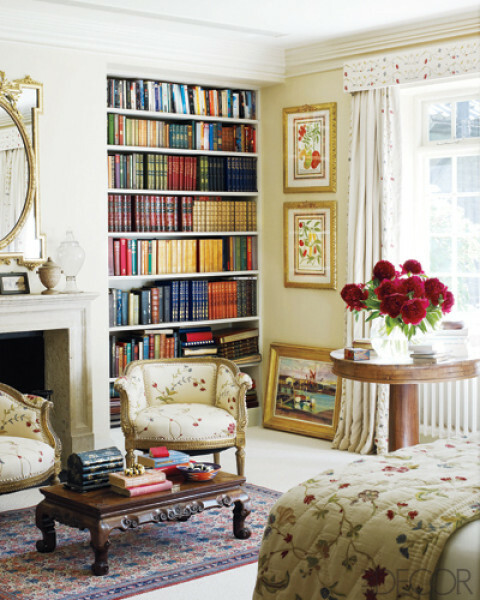 And I have to agree with Audrey about the chairs & Simon about the books – but it’s a bright lovely room. Love the fabric print in this room! And pretty much everything else about it. Best of luck to you on the job hunt, and may you enjoy a relaxing weekend. Oh what a pretty pretty room — I want it. I love the chairs, and have no problem with the picture against the wall, as I have a few of those myself. Oh yes and best of luck with the interviews! That is a lovely room! I enjoy my bedroom where this week I have read The Navigator of New York and The Book Thief. I have a beautiful French chair but I choose to sprawl. Good luck with your interviews.